Janice Horton - author of romantic adventure novels: Voodoo Wedding – Launch Party next Friday 1st March! 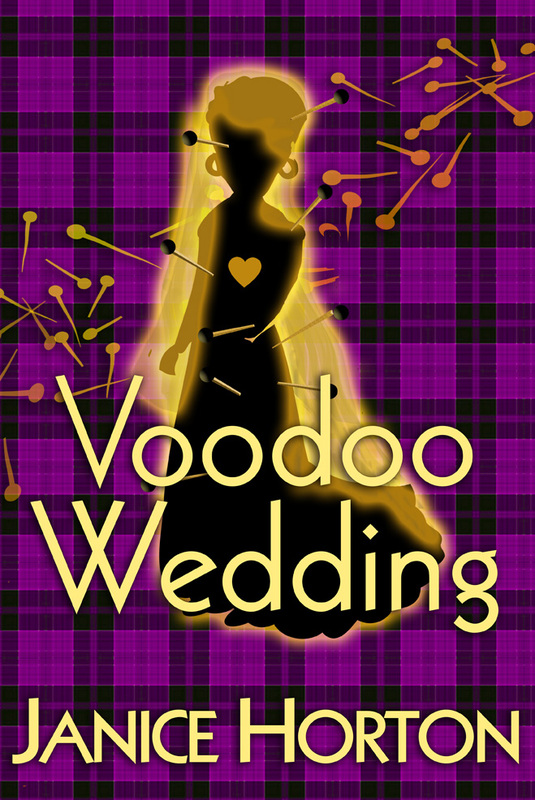 Voodoo Wedding – Launch Party next Friday 1st March! You may remember that when I launched How Do You Voodoo? we did it with the magically inspired Spellbindingly Fun Blog Party? This time around I’m hosting a Voodoo Wedding Facebook and Twitter Party! I’m asking you to pop over to the Party Events Page on Facebook now to ‘join’ the party and then to attend at any time of the day and/or evening on Friday 1st March. There WILL be THREE Prize Draws plus a wedding ‘favour’ for all party peeps on Voodoo Wedding Party Day! Win one of THREE gorgeous Purple Tartan Pens! 3. POSTS A PHOTO of their wedding dress on the Facebook Party Page or on Twitter OR a picture of what you might consider to be your ideal wedding dress – in this case you can be as quirky or as bridal couture and you wish - and shoes and handbags are welcome too! If you pop over to the FB Party Page just now you’ll see some photos already posted including one of me! Do ALL THREE to get in all THREE Draws! Join the fun next Friday 1st March! Something old, something new, something borrowed - something voodoo! Happy Friday everyone! I had to delete the comments above as they were spam. I seem to be getting hit with spam more often and might have to consider restating the spam catcher - where you have to type in the annoying word to prove you are not a robot? Might wait until after the Voodoo Wedding launch to do it though. So if you see posts deleted - I'm not being rude just zapping the spam - so please do leave your comments. I sympathize with the spam situation. For a while it was the guestbook on my webpage getting hit on a daily basis. It's been left alone for now but my blog gets it, too. I use Akismet to block the spams. Not sure if there's a version of it for Blogger or not. Anyway, looking forward to the party next Friday! Nothing like a wedding to get you feeling all warm and fuzzy. Looking forward to it, Janice! I had to stop allowing anonymous comments when I started getting too much spam a while back, rather than using the captcha. Thanks everyone - and for the splam busting tip, Rosemary. I went in and changed the settings to stop anonymous comments. Do let me know, though, if anyone has had a problem commenting here as I value your input. You can either email me at janice@janicehortonwriter.co.uk or leave a message on my Author FB Page. Just wanted to say how much I'm enjoying all the photos already being loaded onto the Voodoo Wedding Facebook Events Page. The wedding photos are soooo romantic and there are some fabulous hats, shoes, handbags, dresses - and suggestions for the voodoo wedding playlist! Pop over to join the fun this week and on Party Day - Friday 1st March! or follow the link on this week's blog post. Hi Linn - I'm loving the photos and can't wait for Friday - I do enjoy an online party. I'll be sure to have a bottle of something fizzy to open in the evening to make sure it's not all virtual! A note on the spam - it's decreased lots since I changed the setting. This is an interesting theme! I am also getting married and as for now I have finalized a rustic theme for the ceremony. I am just looking for one of the best Chicago venues that can be decorated and arranged in that manner. It was wonderful going through this new idea as well.